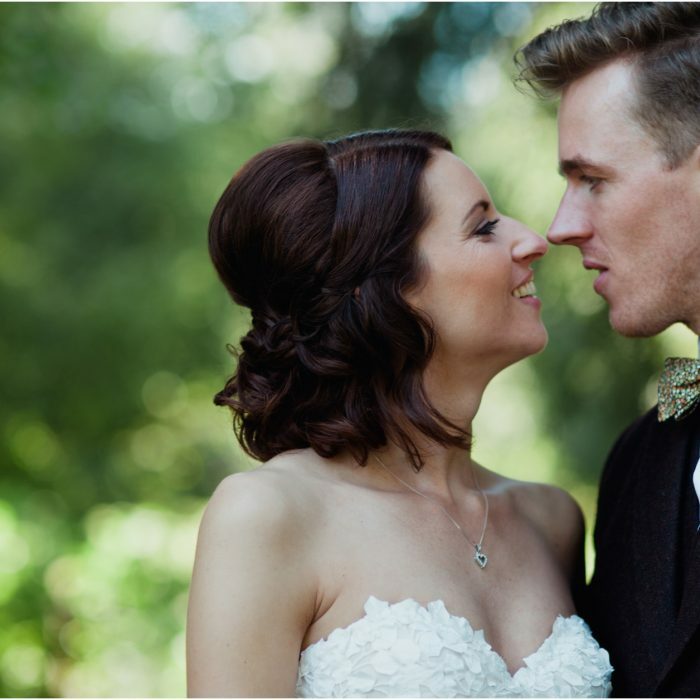 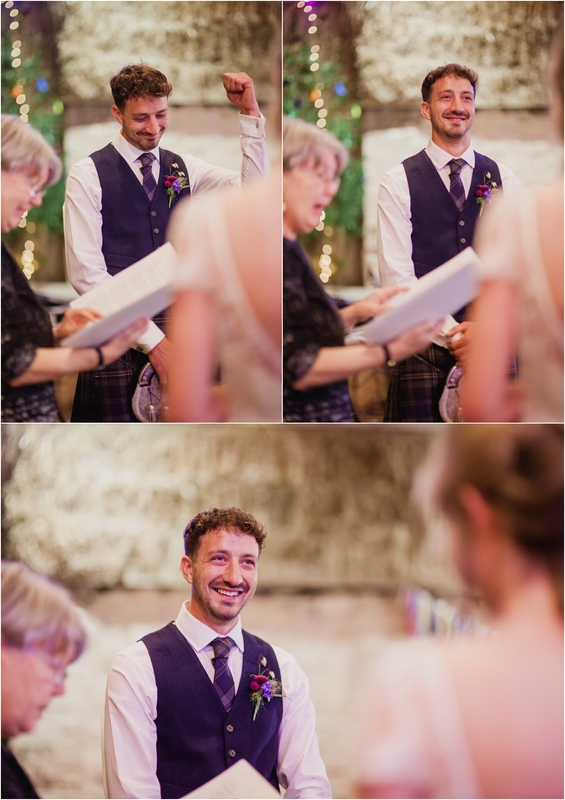 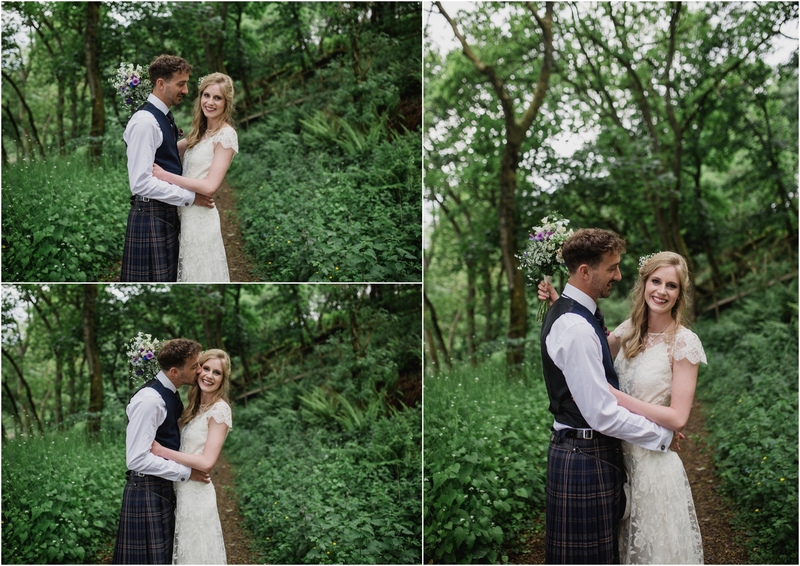 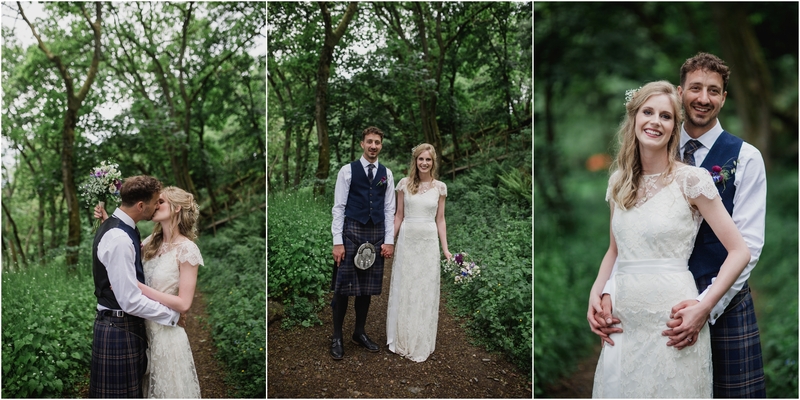 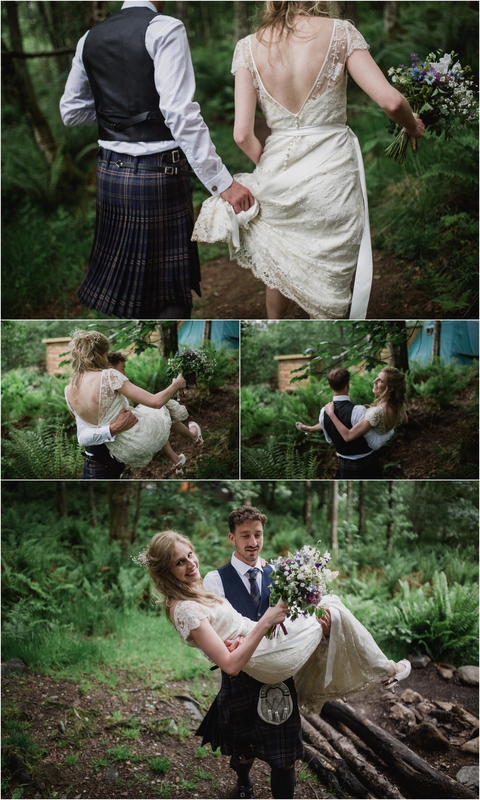 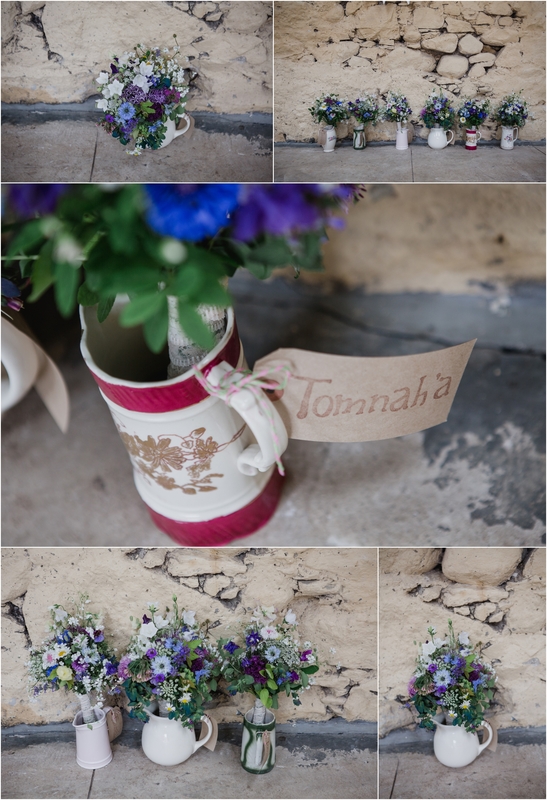 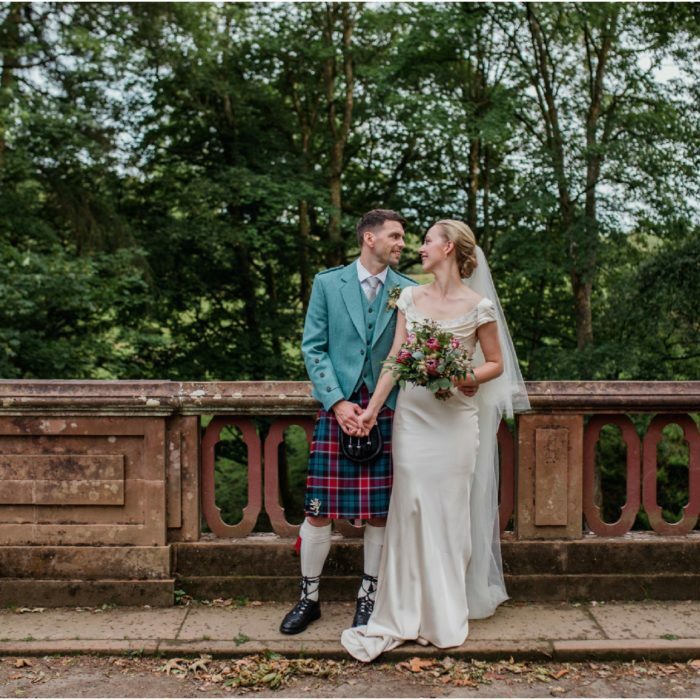 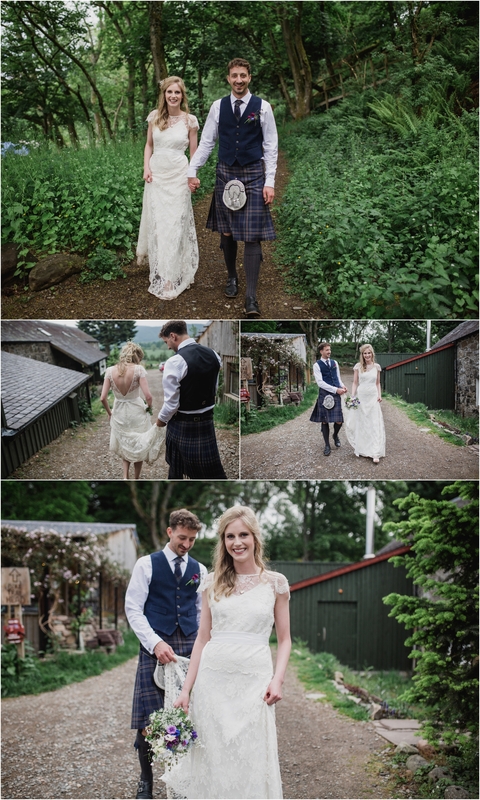 Fiona and Robert who got married at Comrie Croft in May. 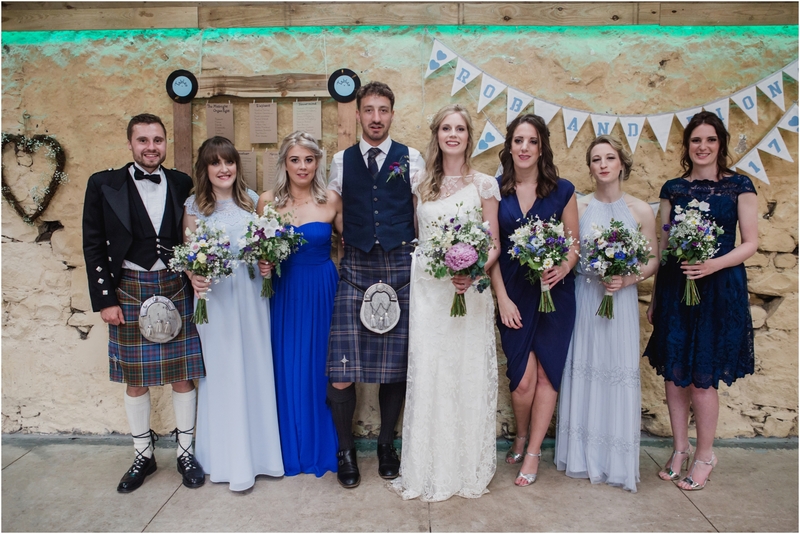 Having met at Dundee Uni they both had a secret crush on each other becoming firm friends before getting together at the end of uni. 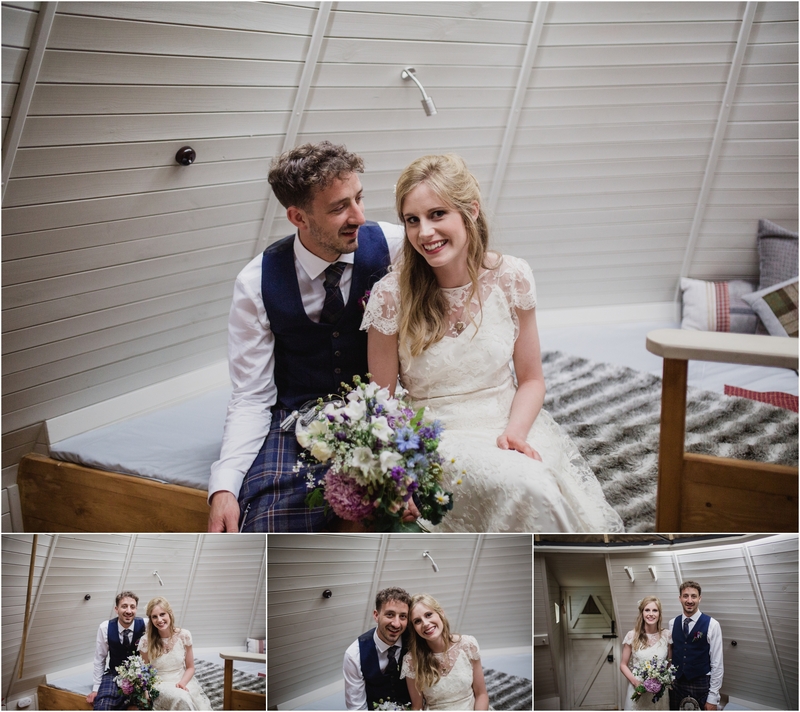 They both have a strong sense of adventure with Robert sharing Fiona’s love of hillwalking and proposing at the top of Ben Lomand. 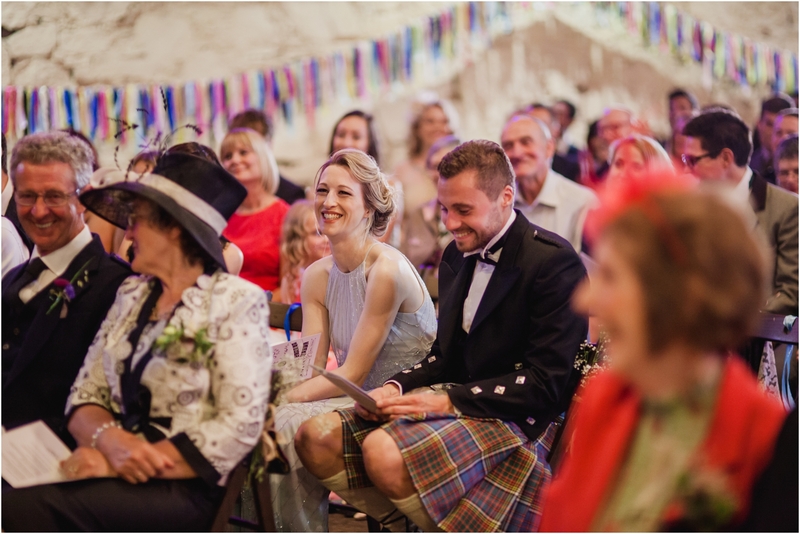 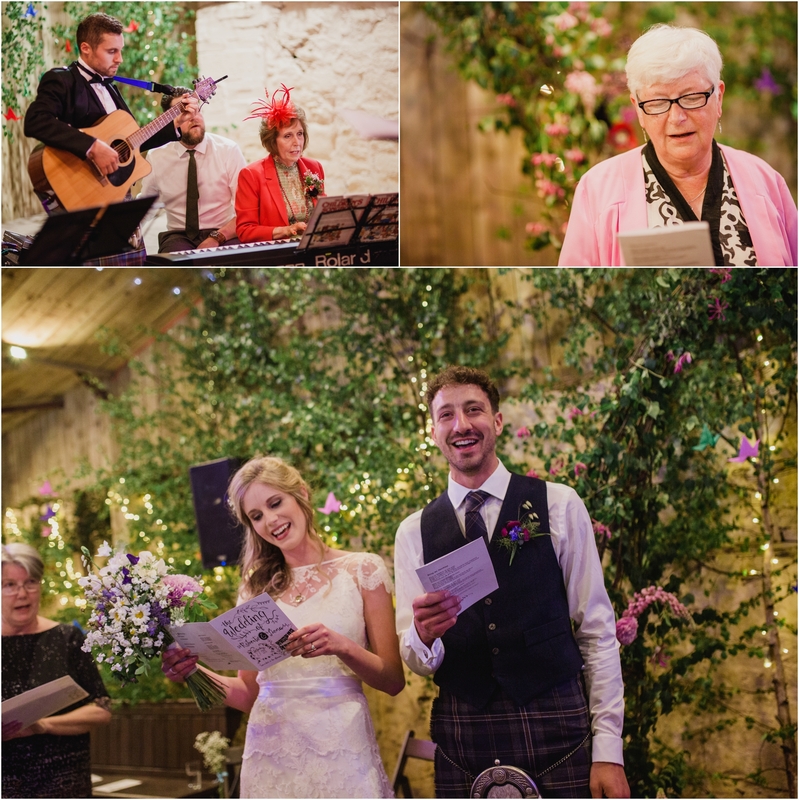 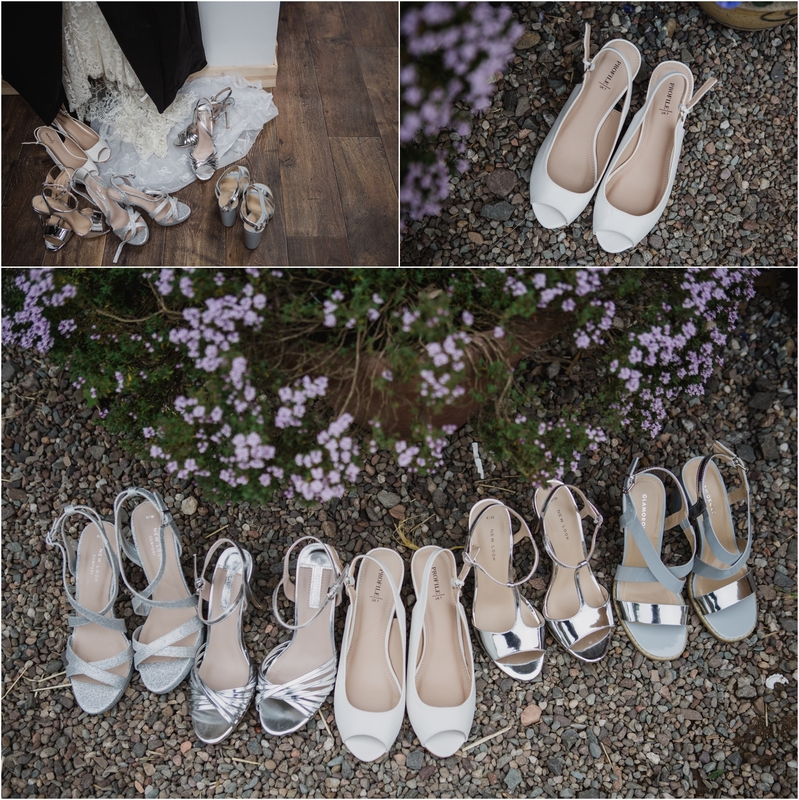 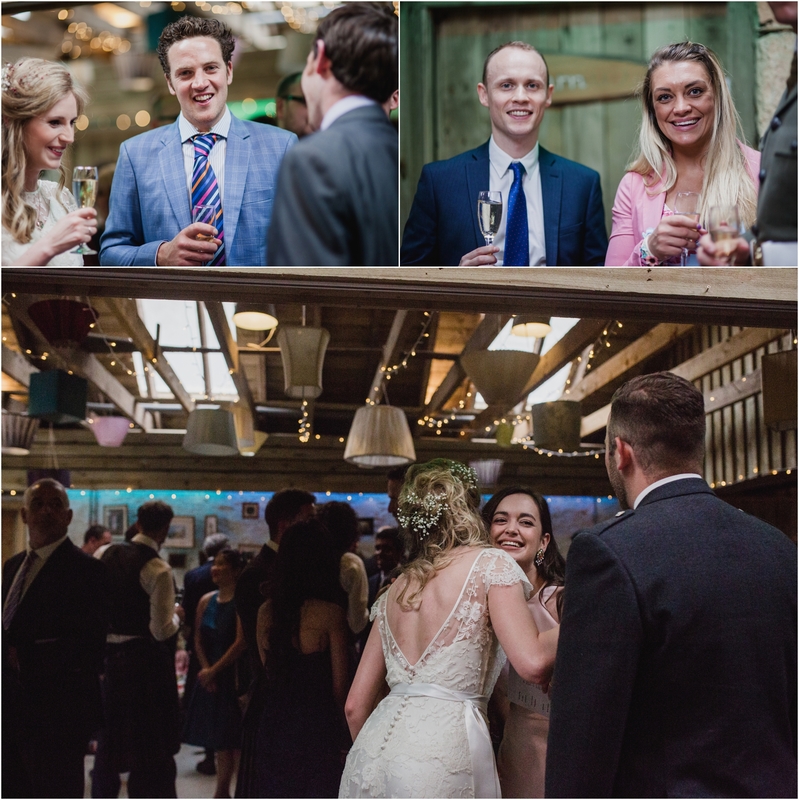 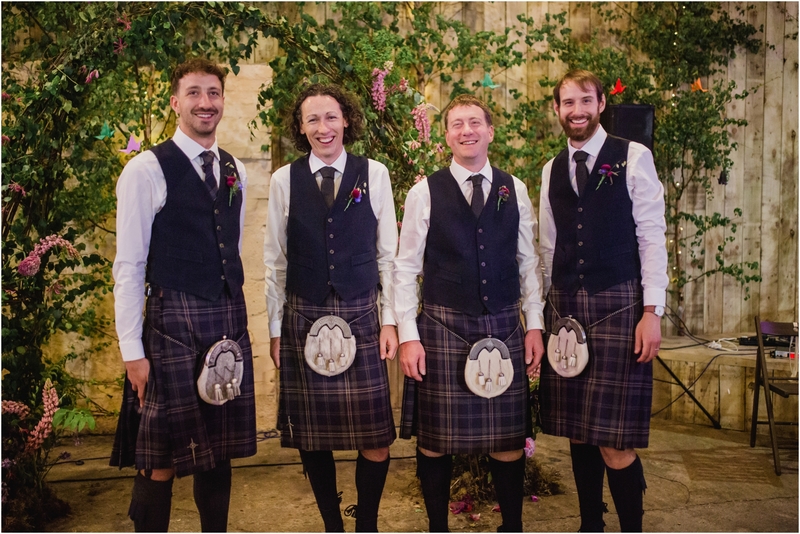 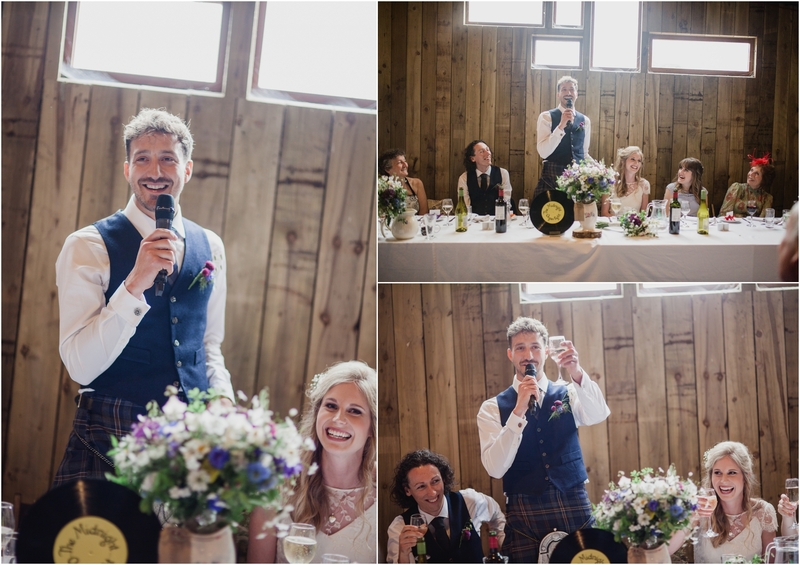 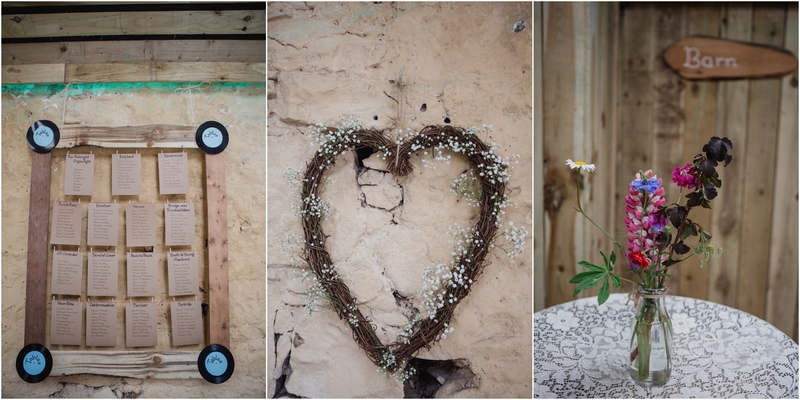 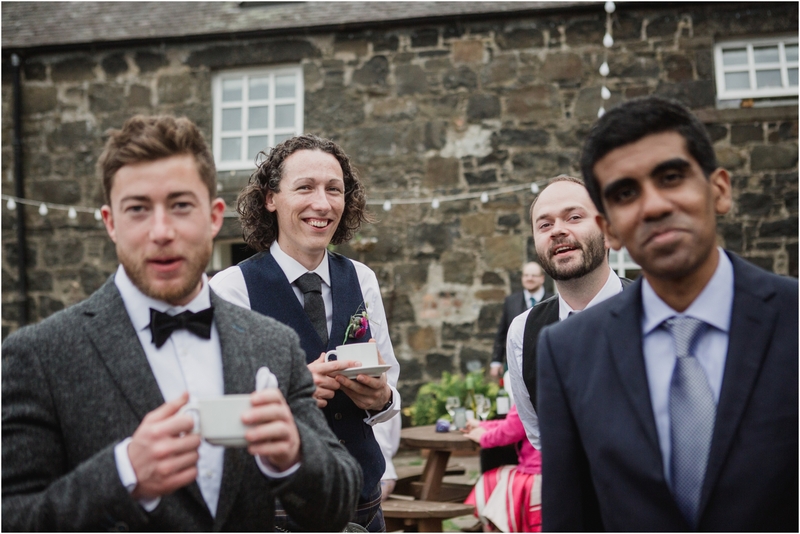 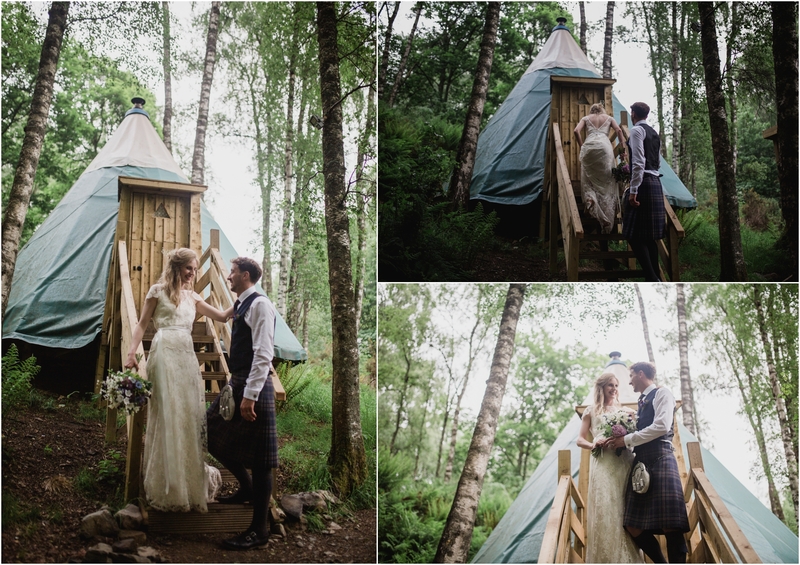 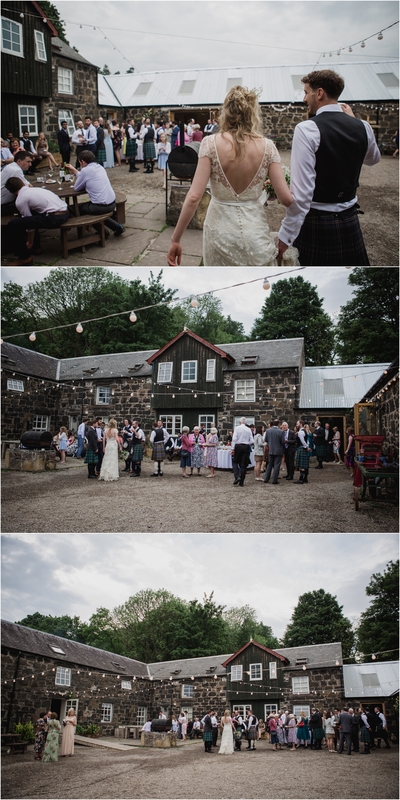 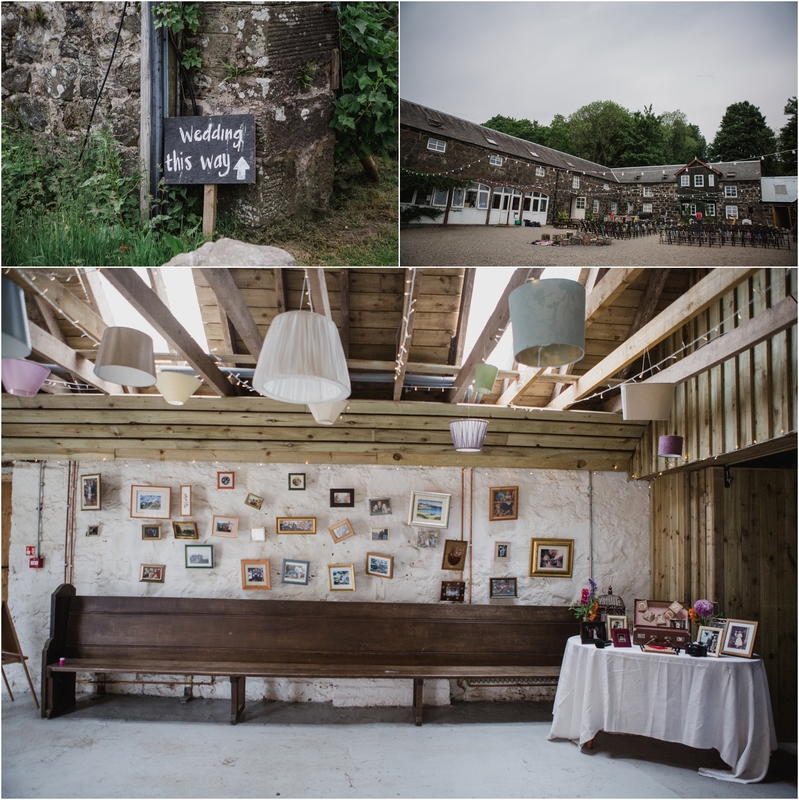 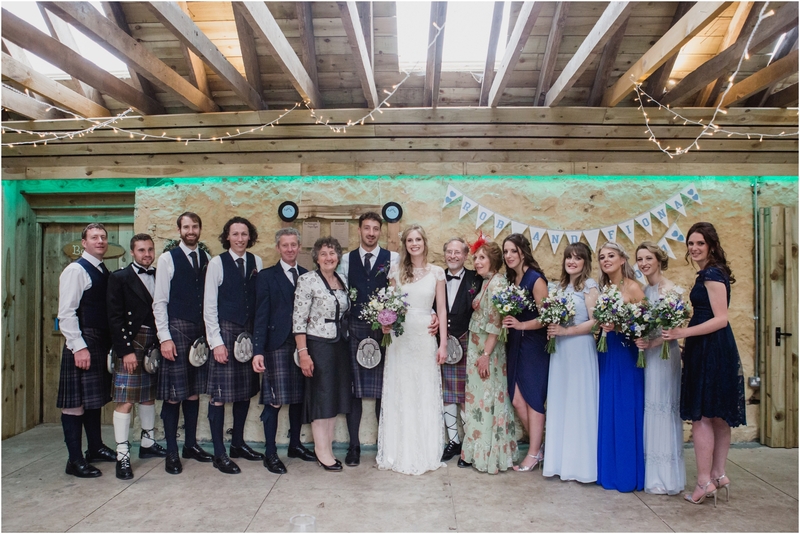 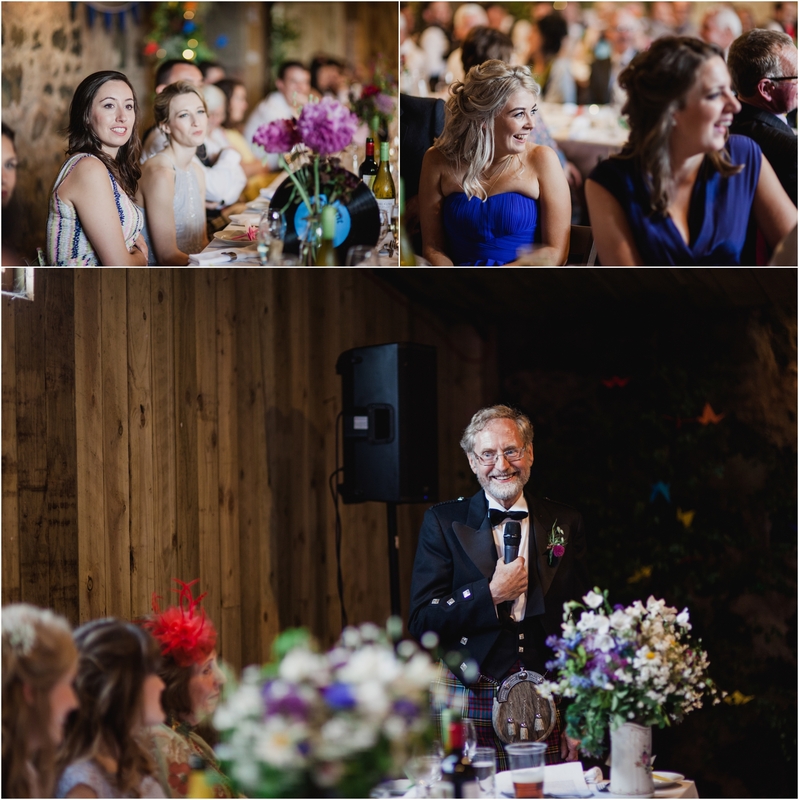 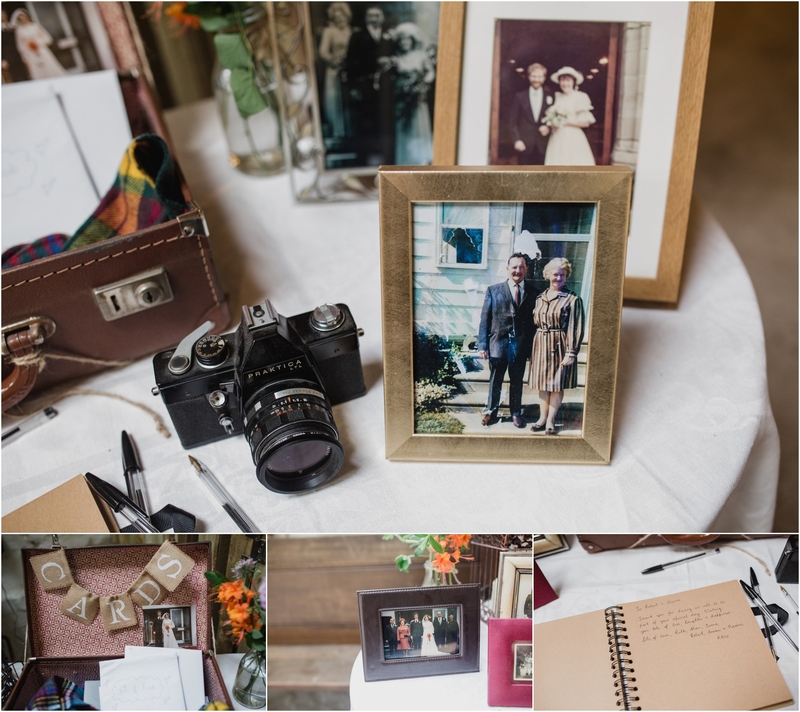 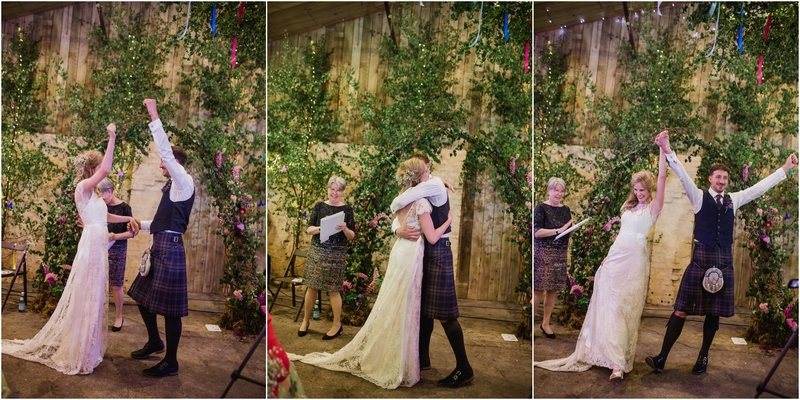 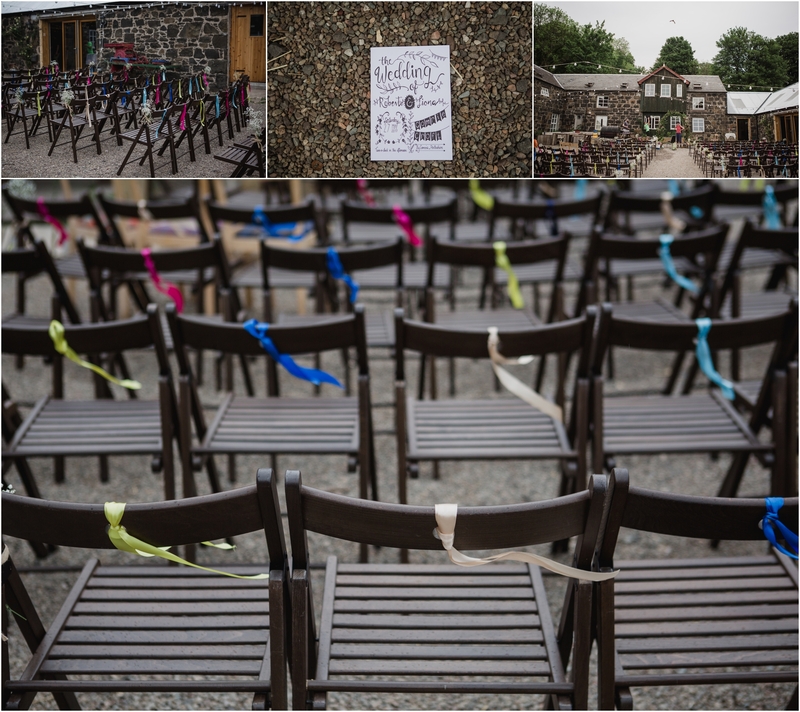 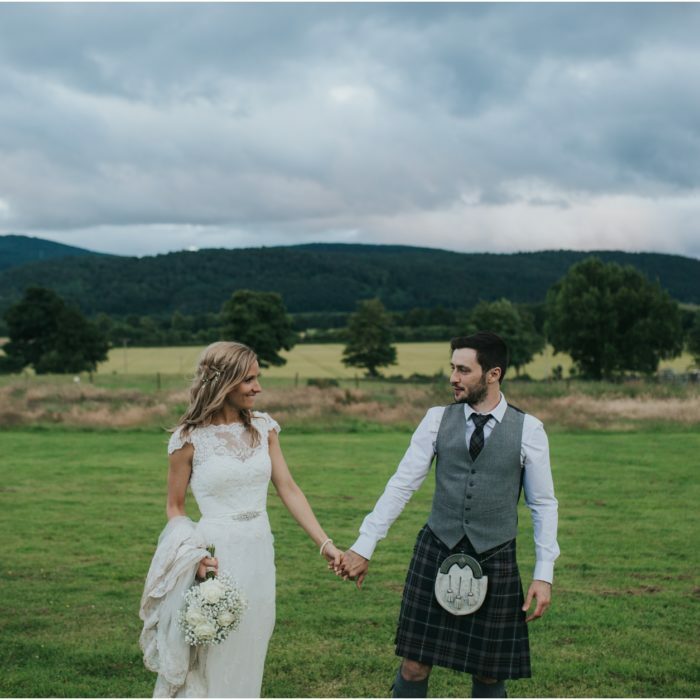 Comrie Croft is a large barn style venue allowing couples to put their own style to the day. 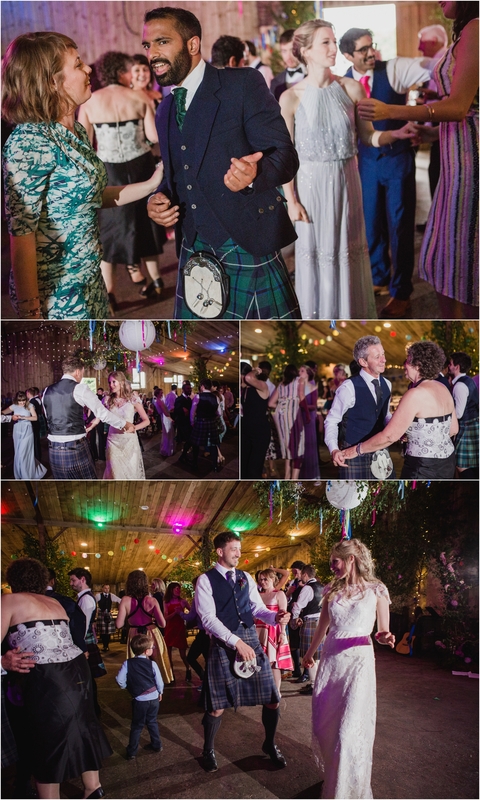 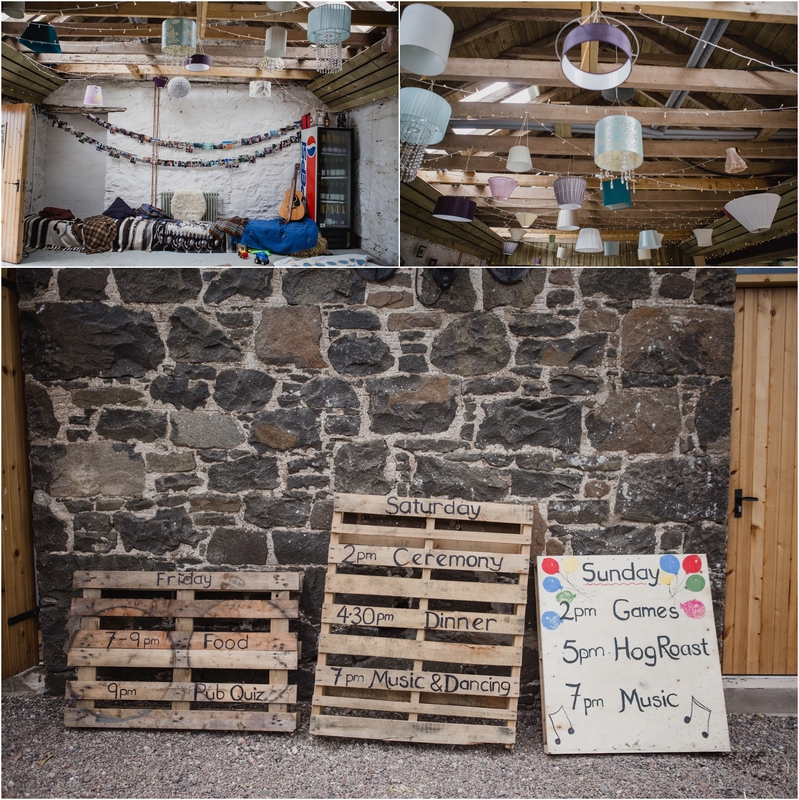 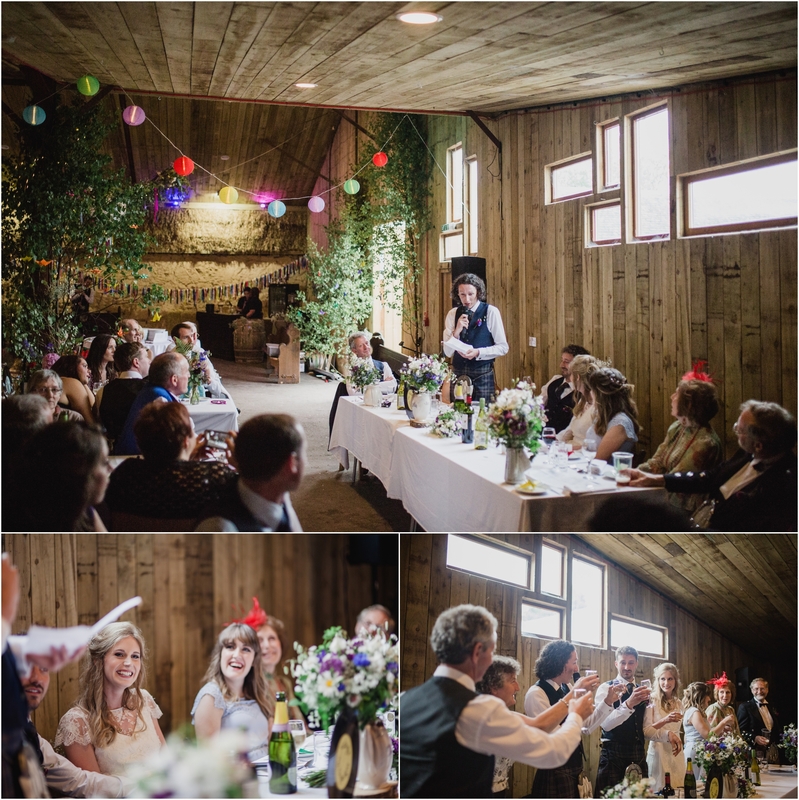 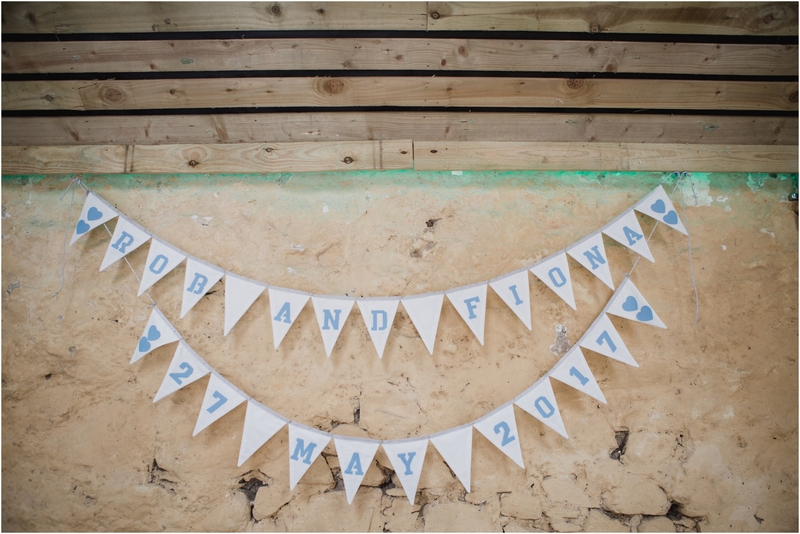 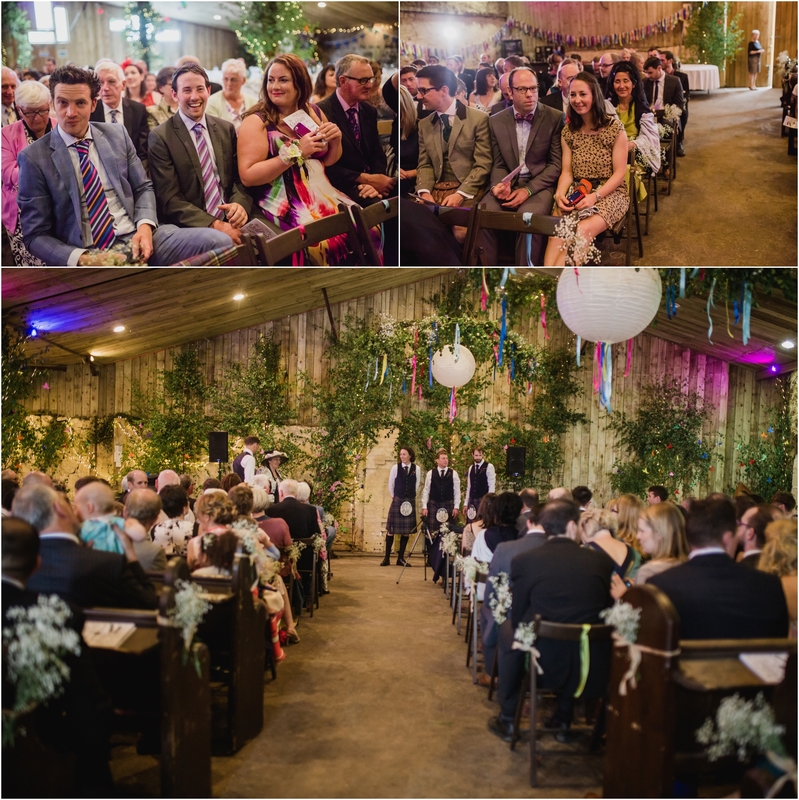 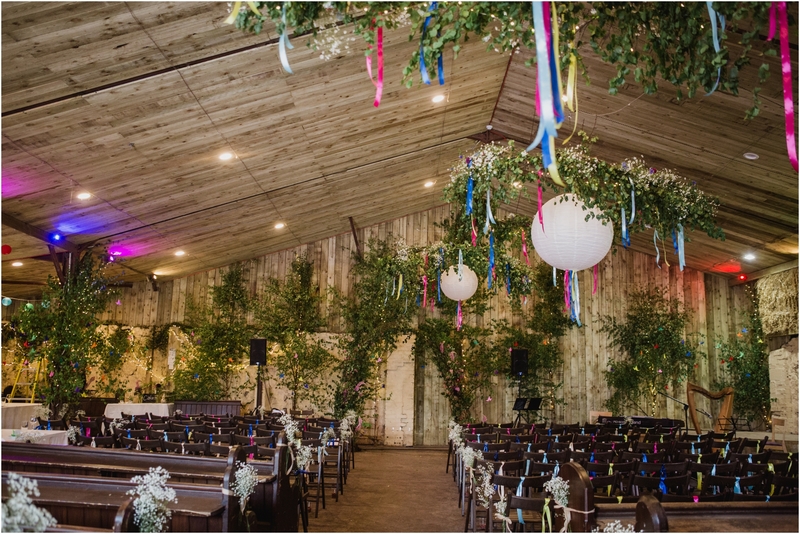 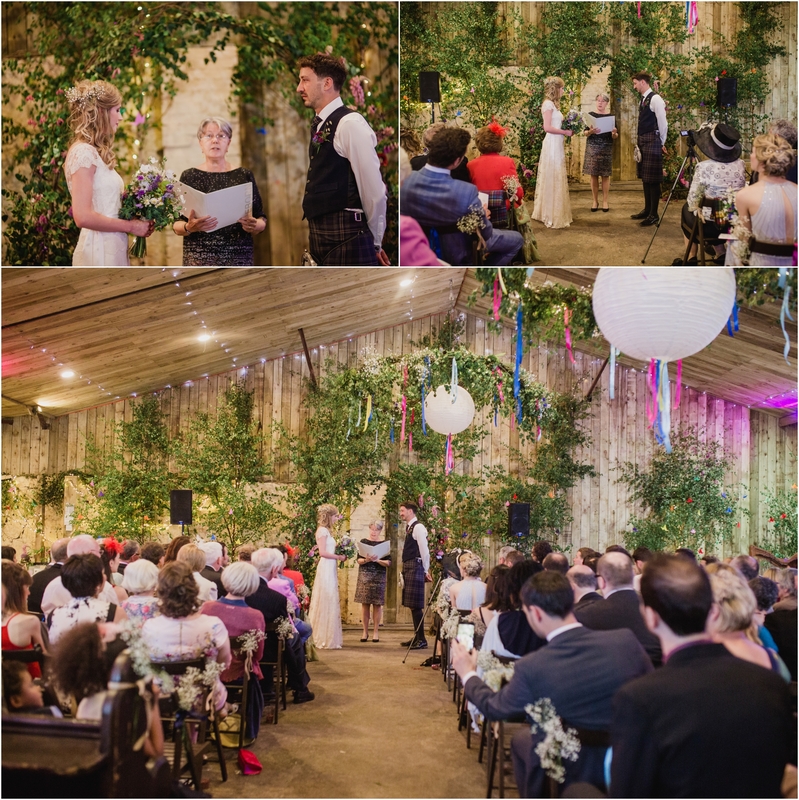 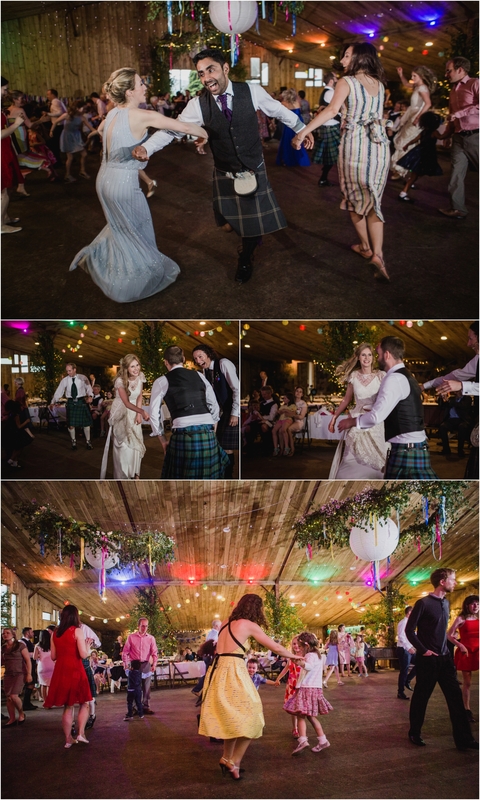 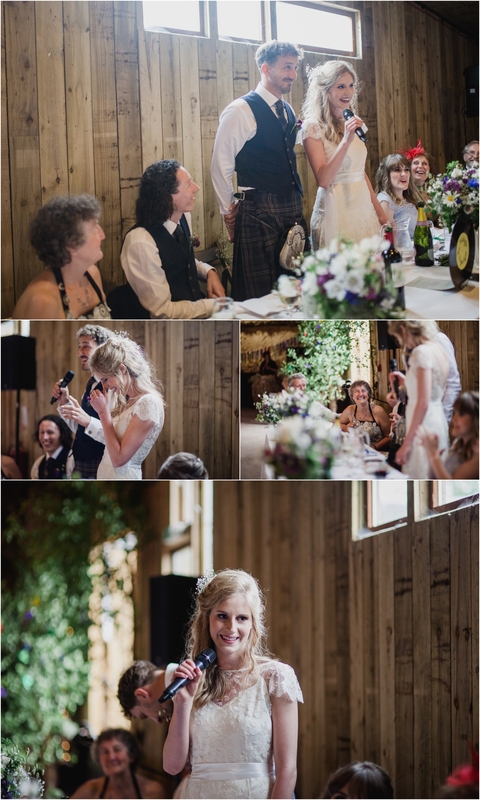 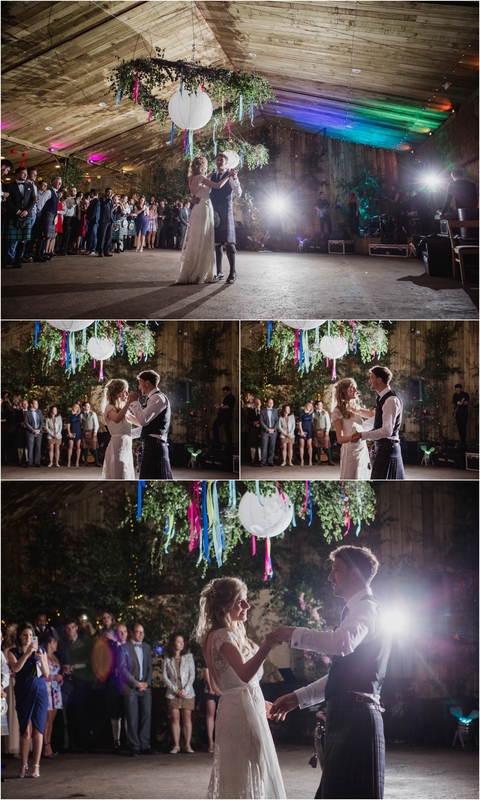 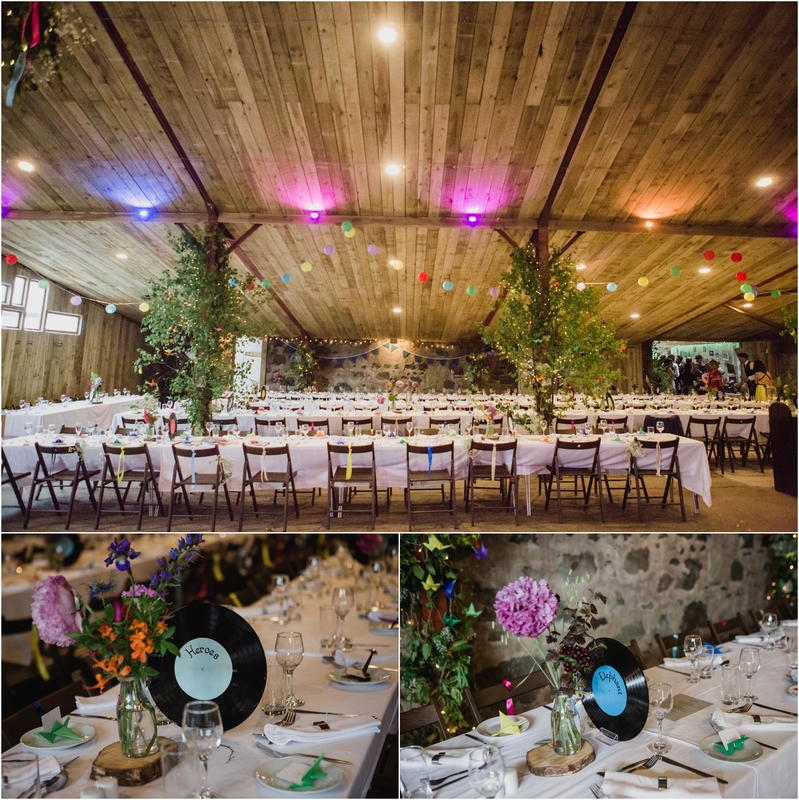 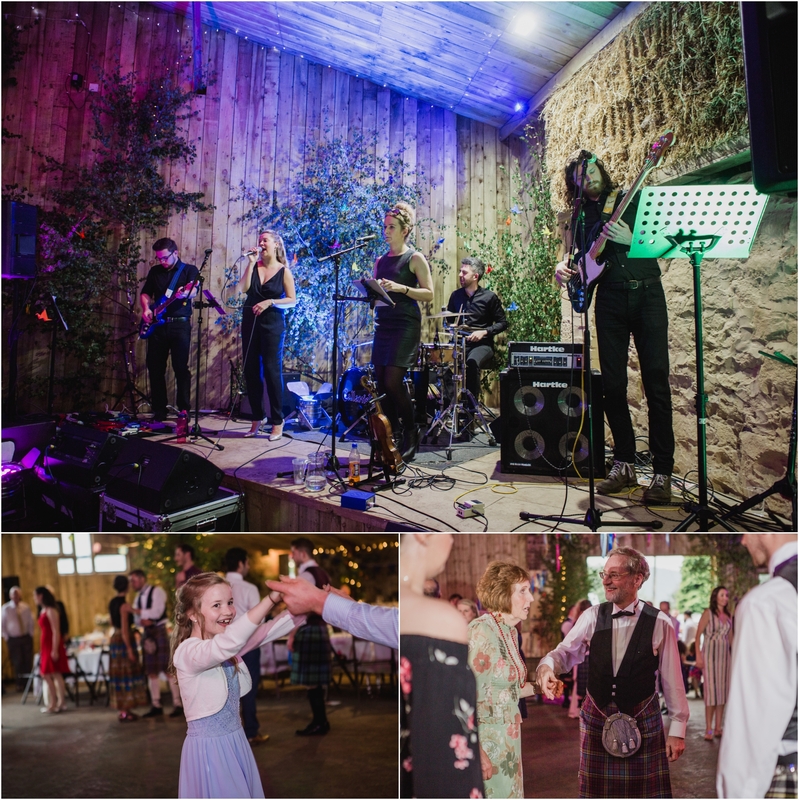 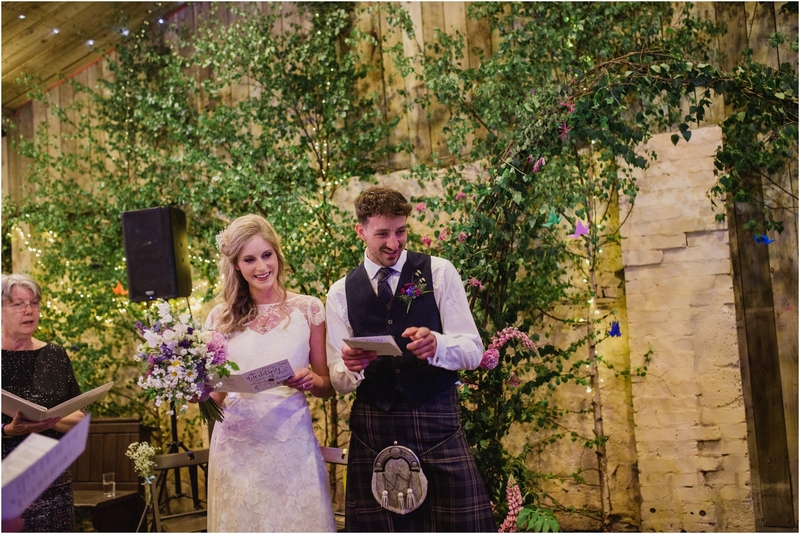 The venue was the perfect fit for their laid-back style with stunning venue decor by Tomnah’a Market Garden and festoon lighting and hay bailes by Comrie Event Hire. 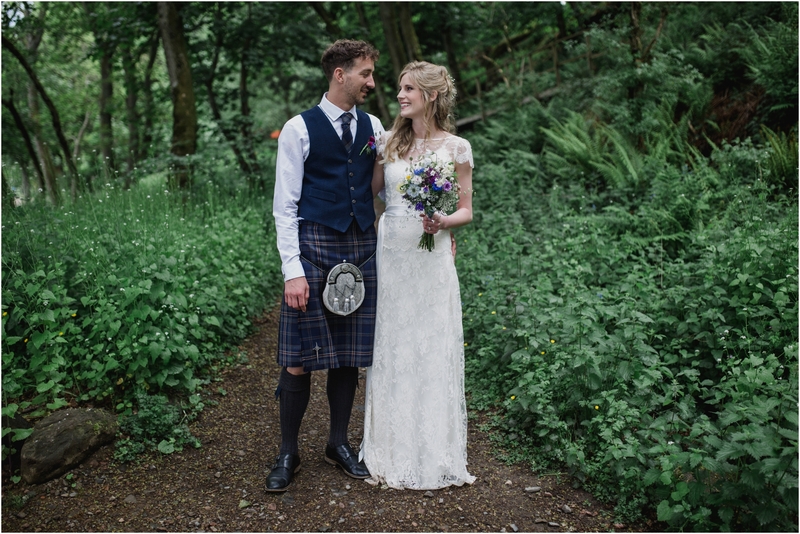 Fiona chose a vintage style lace dress by Halfpenny London from Priscilla Bridal with hair by Louise Quinn and makeup by Cheryl Clark. 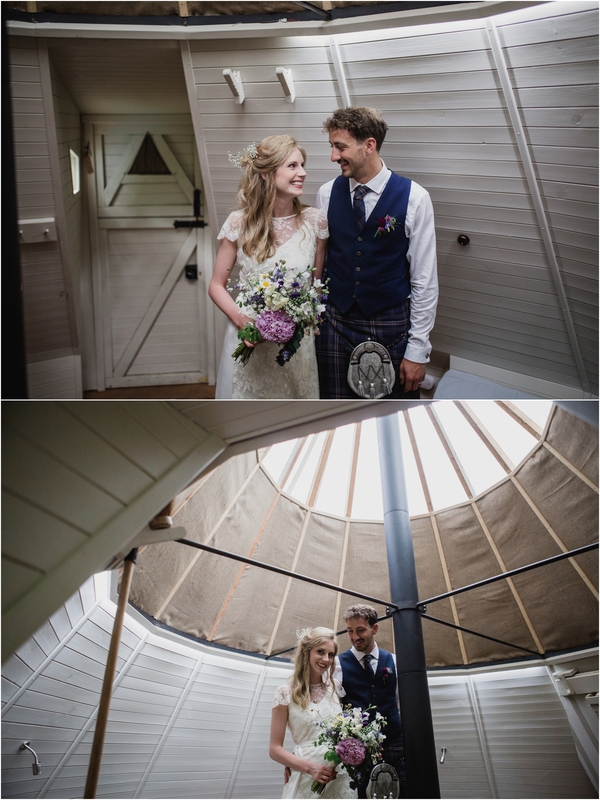 Sadly the Scottish rain kicked in, but they didn’t let it ruin the day, they moved the ceremony inside and got started with the celebrations. 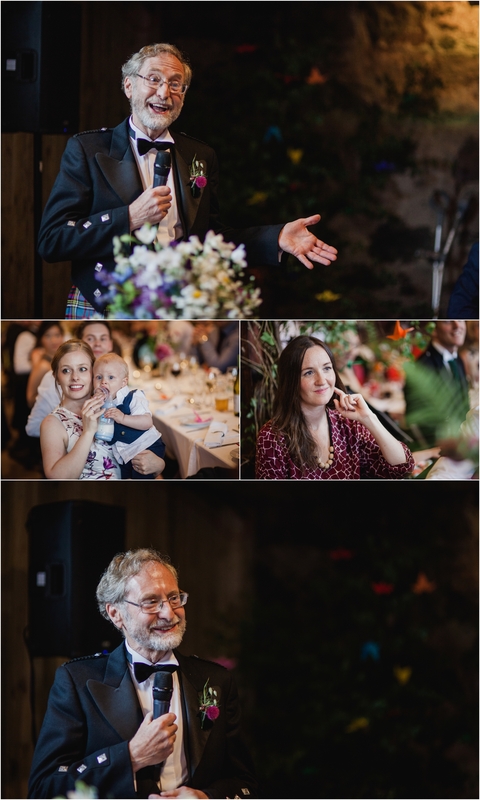 Christine Bush carried our their upbeat humanist ceremony (with many emotional tears) with lots of participation and songs their family and friends including a gorgeous cover of The Wedding Song by Bob Dylan by Fiona’s brother Tim. 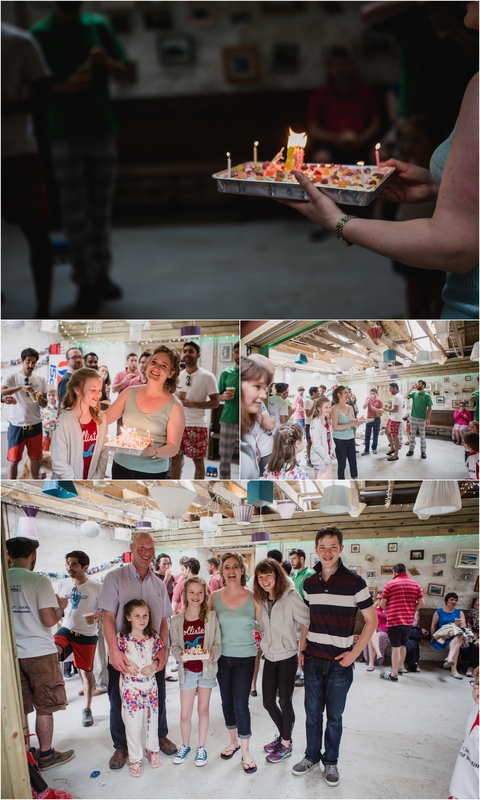 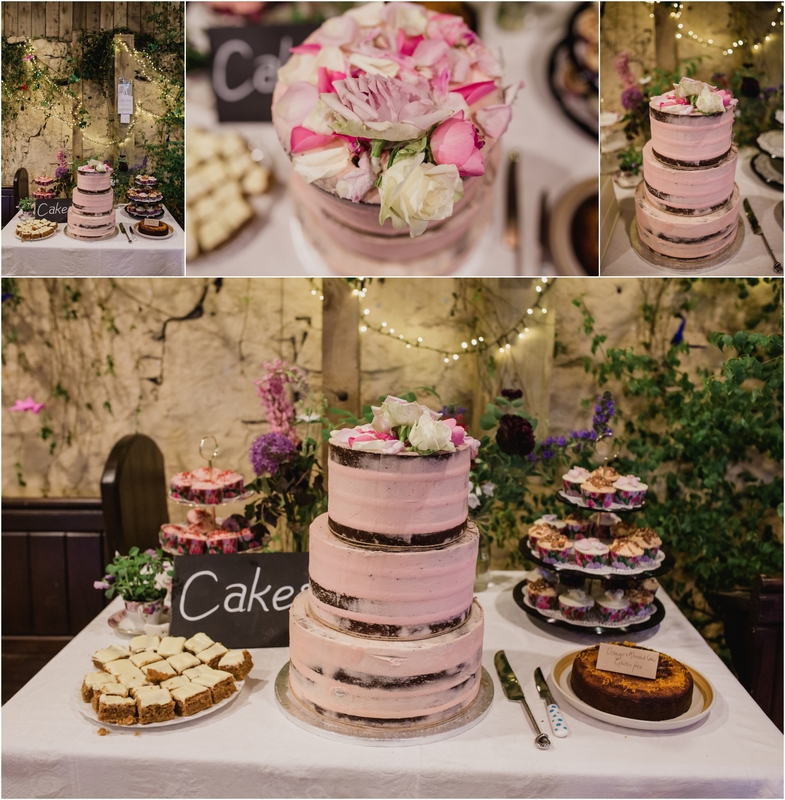 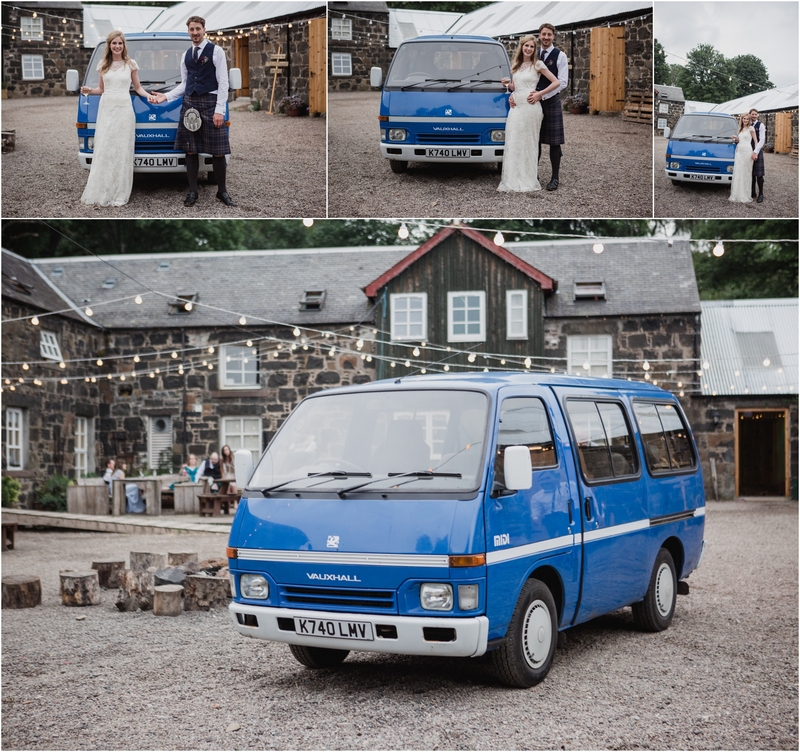 They had lots of yummy buffet style dishes expertly cooked by Andrew Scott Catering for their meal, kegs of beer by Fallon and their stunning wedding cake was made by Artisana. 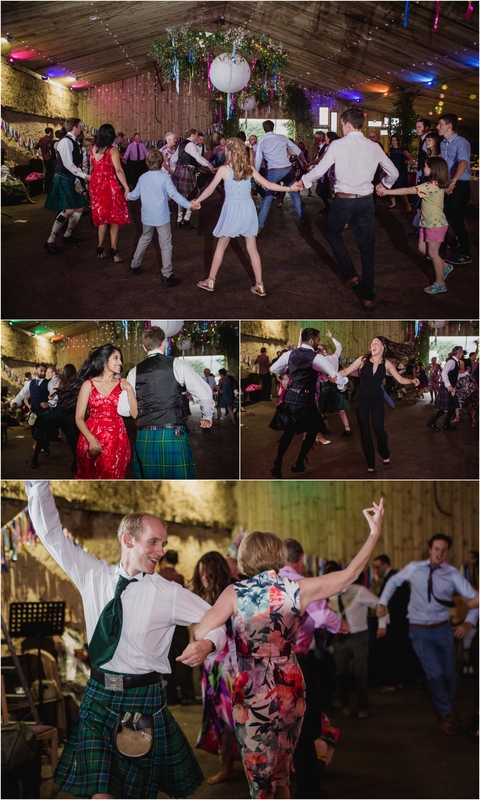 Their evening was topped off with some awesome ceilidh dancing and music by Callusing. 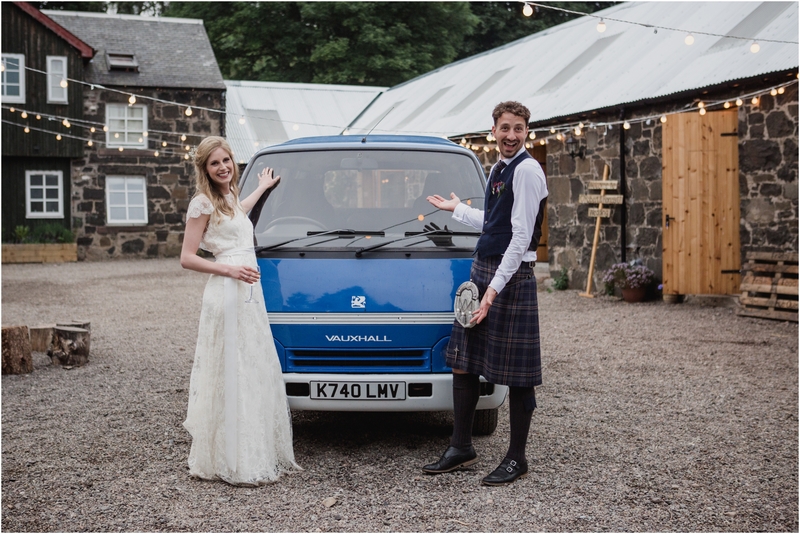 Fiona and Robert enjoyed their honeymoon adventuring around Scotland in their VW camper van. 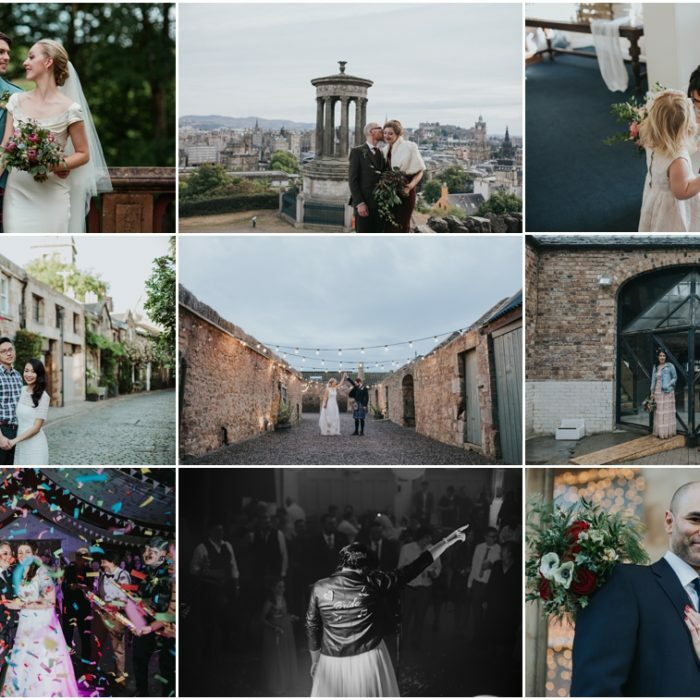 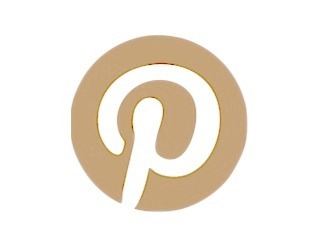 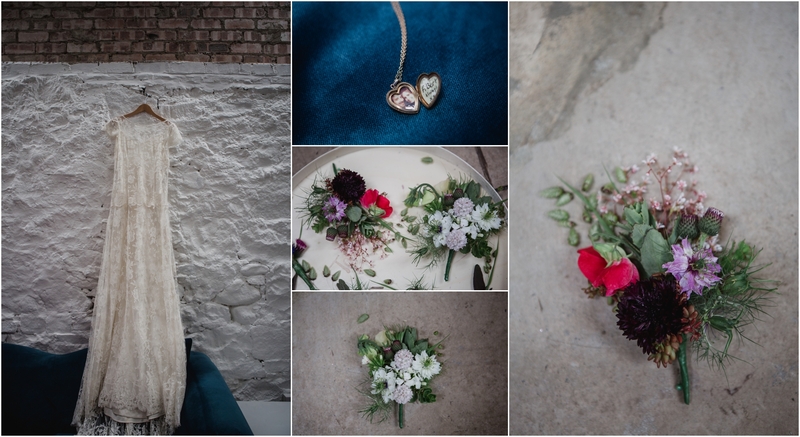 Thank you for having me as your photographer – I had an incredible day capturing it for you.